Ireland arrived at Murrayfield for the second match of the Guinness Six Nations campaign knowing their title hopes were already on the line. Joe Schmidt's men won a Grand Slam last year but defeat to England in this term's Dublin opener meant they could not afford another slip-up against the Scots. 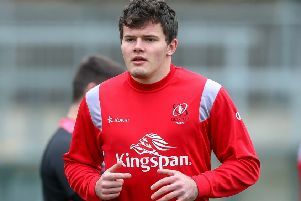 Munster's Chris Farrell came in to make his first Test start in almost a year as he replaced the injured Robbie Henshaw, while Rob Kearney was back at full-back after the experiment of moving Henshaw to 15 failed against Eddie Jones' Red Rose. Blair Kinghorn had to settle for a place on Scotland's bench despite scoring the Dark Blues' first Championship hat-trick for 30 years in their win over Italy as Gregor Townsend decided he required Sean Maitland's experience on the left wing to quell the Irish. The Scots knew they had to take advantage of any doubt in the visitors' ranks early and set about putting the squeeze on. They kicked an early penalty to the corner but when they failed to produce a try Greig Laidlaw did not waste another opening as he booted over a seventh-minute penalty. But it was Ireland who touched down four minutes later as Jacob Stockdale forced Tommy Seymour to scramble back. The Glasgow man won the race but overcooked a simple pass to Maitland and Conor Murray pounced for an easy score. And the Irish stretched further ahead on 17 minutes when Stockdale burst past a limp Simon Berghan tackle to race home between the posts off a lovely planned move. The Irish score came after Scotland suffered a major blow as Stuart Hogg was forced off clutching his shoulder, while there was disappointment for the visitors as Jonny Sexton had to be replaced having been caught heavily by Allan Dell in the lead-up to Stockdale's run in. But Townsend's team did not let the loss of their star full-back spoil their afternoon and hit back just before the half-hour mark. Finn Russell pounced on Joey Carbery's pass and raced 40 meters to within a yard of the line. Keith Earls brought the Racing 92 playmaker down but Russell remained calm, popping off gloriously from the deck for Johnson to score. Scotland were back on the front foot but, having been dominated physically by England last week, Ireland stood up to a full-blooded Dark Blues assault as they repelled drive after drive to hold on for a 12-10 half-time lead. It was Ireland's turn to apply the pressure as they second half got underway but Scotland's defence was just as resolute as they held firm before Keith Earls was pinged for not releasing. A forward pass by Russell to Rob Harley then cost the hosts the chance to break free. But a blunder by Harley and Dell as both men failed to get a hold of Carbery handed Ireland the chance to strike. The substitute fly-half sped through the gap before slotting in Earls for the third try after 55 minutes. Laidlaw nailed a penalty from wide on the left to bring the Dark Blues back within six points of Ireland with 18 minutes left on the clock. But Carbery responded with three points of his own moments later to again put clear daylight between the teams. And when Schmidt's men stole possession off a wayward Fraser Brown line-out late on that was enough to secure a 22-13 victory and keep alive hopes of retaining the title. The Scots will look back on another match in which they let the Irish off the hook with their own mistakes.